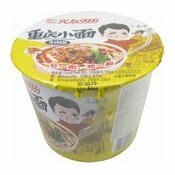 Ingredients: Noodle: Wheat Flour, Sweet Potato Starch, Refined Vegetable Oil (Rapeseed Oil). Sauce Pack: Refined Vegetable Oil (Rapeseed Oil), Bean Paste (Broad Bean, Pepper, Salt), Chilli (Capsicum Annuum L.), Soy Sauce (Soybean, Salt, Wheat), Salt, Flavour Enhancer (E621), Hydrolysed Vegetable Protein, Sweet Potato Starch, Flavour Enhancer (E635), Artificial Beef Flavouring, Spice. 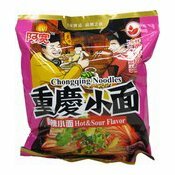 Spice Pack: Salt, Sugar, Dehydrated Cabbage, Dehydrated Vegetable, Dehydrated Scallion, Artificial Beef Seasoning, Flavour Enhancer (E621). 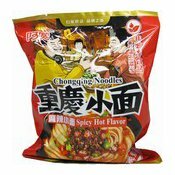 Simply enter your details below and we will send you an e-mail when “Chongqing Instant Noodles (Non-Fried, Artificial Beef) (光友重慶牛肉碗麵)” is back in stock!